In the marketing material for this play, it says "This is not a story a about a foreign war. It's a story about falling in love ..." So much for truth in advertising. 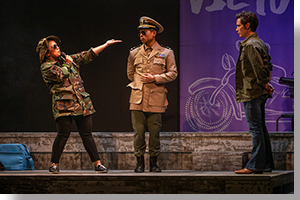 Yes, the story spends most of its time retelling the love story of the playwright's parents in a comedic and hyperbolic fashion, but the script is filled with an extremely one-sided view of the war in Vietnam and ends up as a screed. The Gulf of Tonkin Incident—like the sinking of the U.S.S. Maine (the premise for the Spanish America War), the Reichstag fire (the premise for Hitler seizing power in Germany), Pearl Harbor (the premise for U.S. involvement in WWII), 9-11 (the premise for "the endless war on terror"), and the gas-attacks in Syria—was a false-flag event managed by a small group of persons whose objectives we have discussed at length in various articles (e.g., here) and in our new book. It's really a shame that an amusing, well-acted farce finds it necessary to have its characters spew propaganda on political issues about which the author has no understanding, other than the narrow view of the dispossessed who were on the wrong side of history; but apparently, it is the season to attempt to resurrect the war in Vietnam as a righteous act of self-sacrifice and altruism on the part of the U.S. Like the wars in Afghanistan, Iraq, Libya, Yemen, Syria, and elsewhere (the U.S. has troops in over 150 nations), the war in Vietnam was in violation of international law. Another contemporary example of trying to change history via the stage is the musical Hamilton. Anyone depicting U.S. troops as heroes (e.g., John McCain) is serving the interests of the war criminals who perpetrated atrocity after atrocity, the evidence for which is still visible in Vietnam, and who, we hope, will someday come to trial, whether they are living or dead. If there were any heroes in this war, it was those who protested it, were arrested, and gave up potential careers to end it. By this, we mean no disparagement to those who served thinking they were bringing democracy to the world, when they were simply cannon fodder for the Anglo-Euro-American banking cartel and its corporations. In Vietnam, the cartel simply changed proxies, from France to the U.S., to continue its plans for colonializing Vietnam. In the final scene of this play, the character representing the playwright's father reels off a long monologue about the atrocities of North Vietnamese troops against those who, in reality, supported and collaborated with the French and then the U.S. against those who were fighting for the sovereignty of their own country. There is, of course, no mention of the use of napalm and agent orange by the U.S., or its indiscriminate carpet bombing of vast sections of Vietnam. This, along with gratuitous references to "the communists" throughout the play spoil what otherwise is entertaining, if a bit superficial, fun, where pure fantasy (ninjas) and weak satire (caricatures of hippies) are freely mixed with personal history. Instead, we are asked to adopt the thinking of McCarthyites, as the blue party marketing brand has done, and believe that because we are entertained (like Hamilton), the historical references are true— which is, wittingly or unwittingly, a tactic used for PSYOPS (propaganda generated by intelligence services). All of this shameless agit-prop aside, there are some excellent performances (tucked in-between a series of hyper-melodramatic encounters), particularly those of the principals, Quang (Glenn Morizio) and Tong (Lisa Helmi Johanson), who represent the playwright's parents as young lovers, as well as supporting characters, Huong (Melody Butiu), Tong's mother, and Nhan (Brian Lee Huynh), Quang's buddy. Marizio and Johanson wow us with their hip-hop and rap deliveries and their feisty chemistry. The craft work is clever, including the original music. 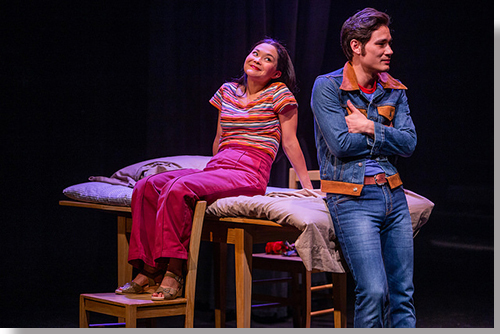 The Denver Center Theatre Company's regional premiere of Vietgone, by Qui Nguyen, runs through September 30th. For tickets: https://www.denvercenter.org.